Which of these words cracks you up the most? Was it an omen or a coincidence? A young boy writes himself an epic adventure...which starts to come true! Jayden refused to give up. He sat on his bed, staring intently at the blank piece of paper at the front of his brand-new journal and chewing on the end of his pencil. It’s hard to come up with the perfect first line for a new story when your sister is complaining to your parents that you won’t let her in your room, your mum is yelling at you to tidy your room and the dog is barking at the next-door neighbour’s cat. Every really great story has to have the perfect first line. What should he choose? The classic ‘Once Upon A Time’ was a bit clichéd and Jayden wanted to be more original. He concentrated hard and tried to block out all the noise filtering in to his bedroom. Think, Jayden, think! 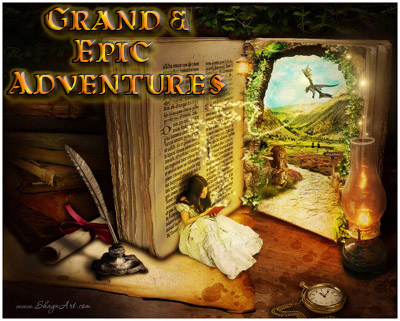 The story was going to be epic – a true adventure novel spanning all possible genres – fantasy and history and adventure and science... Probably not romance though. Jayden frowned and shook his head a little. But he wanted to lead into all that slowly – there was a lot for the average reader to take in, and he didn’t want to throw them into the middle of all the excitement without some explanation and context. Epic. Epic. Epic is a great word, thought Jayden. He’d heard that somewhere and it suited his intentions perfectly. This would be an epic story. Grand. That was another good word. Hmmm.... Jayden decided to go with epic and maybe later he could come back and redo that first line if he thought he could improve on it. And so began his adventure. It was an ordinary morning that gave no hint of the epic day yet to arrive. Jayden wrote slowly and carefully. His new journal was awesome, with a leather cover and he wanted it to be perfect. His mum and dad were always telling him that he wrote too quickly, too messily – he needed to write more slowly so his writing was neater. Grandma said he had good writing though. Jayden looked back over his first line. Yes, that was an excellent start. He wanted to write a story featuring a boy just like him – an eleven year old boy who was interested in the same things as him. Maybe he’d give him a sister like Jayden’s, too. Jayden thought some more, then decided to just go ahead and put himself in the story. It’d be cool to have a hero in a book with his name. Jayden was a pretty good name anyway, wasn’t it? Okay, so first he needed to introduce himself to his readers. Jayden wasn’t your average eleven year old boy. Indeed, he considered himself somewhat special. He didn’t have superpowers or anything. Don’t be silly. He was just a little bit more interesting than your average eleven year old boy. At least, Jayden thought so. Other boys his age were at that pathetic stage of being all silly and giggly around girls. Jayden didn’t think much of that behaviour. He thought girls and boys could be friends without all the silliness. He quite liked his friend Jessica but he hadn’t seen much of her since he moved schools at the beginning of the year. Of course, Jayden had a sister and knew very well that girls weren’t fancy, mysterious beings. Jayden’s sister Caitlin was seven. She was quite different to Jayden but he thought they got on pretty well. Sometimes they fought, but that was because Jayden was introverted and Caitlin was extroverted. Jayden liked big words. His mum had explained introverted and extroverted to him last week and it explained a lot. It meant that sometimes Jayden liked time in his bedroom all by himself without his sister, but his sister liked to have attention all the time. Something like that, anyway. Jayden paused, thinking about where he wanted his story to go first. He was really into mythology at the moment. He had even thought about maybe becoming a cryptozoologist when he was older. A cryptozoologist is someone who studies species that science hasn’t proved yet – the Loch Ness monster or Bigfoot, that sort of thing. Jayden’s favourite was dragons. Yes. Jayden nodded emphatically, even though there was only him to see it. Definitely dragons first. But there were a lot of different dragons. Chinese dragons, European dragons... Even New Zealand, where Jayden lived, had its own dragon called a taniwha. Jayden had done an article on dragons for his homework and forgotten about the New Zealand taniwha. Maybe he should start there. He did live in New Zealand after all. It would be easy to write about his own country first. © Copyright 2017 Elle - away camping (UN: elle at Writing.Com). All rights reserved. Elle - away camping has granted Writing.Com, its affiliates and its syndicates non-exclusive rights to display this work. Generated in 0.89 seconds at 1:01am on Apr 20, 2019 via server WWW1.